The Geological Survey of Northern Ireland (GSNI) is an office of the Department for the Economy (DfE) in Northern Ireland staffed by scientists of the British Geological Survey (BGS) who provide research services to help develop Northern Ireland’s economy and protect its environment. This year GSNI celebrates 70 years of public service, writes Director Marie Cowan. GSNI scientists provide research services to support the legislative responsibilities and strategic priorities of DfE, other Northern Ireland government departments and agencies, Northern Ireland Environment Agency (NIEA), Invest NI and 11 councils. We are based at Dundonald House on the Stormont Estate, where we run an enquiry service and shop; we also manage a national core store and sample repository at Mallusk. We collaborate on research projects with the BGS, Geological Survey Ireland (GSI) and over 35 universities worldwide. Our primary datasets are available on Open Data NI and Spatial NI. We also hold information on geology, engineering geology, minerals, borehole data and site records, mines, quarries and pits, airborne geophysics, soils and water geochemistry. GSNI contributes to, and advises the DfE Minerals and Petroleum Branch on, responses to DfE private and press offices and Northern Ireland Assembly business. In the last three financial years we answered 75 Assembly questions for written answer (AQWs) with topics ranging from sand and gravel resources in Lough Neagh to defining the difference between conventional and unconventional oil and gas exploration. In the same reporting periods, we answered 217 environmental information requests (EIRs) that arose from areas of public interest to individuals and NGOs. In April 2015, the responsibility for planning decisions transferred from the Planning Service to 11 newly created ‘super-councils’. GSNI embarked upon a two-year-long programme of engagement with senior managers and council officials to raise awareness of our data and expertise, as well as providing guidance and advice on the risks and opportunities for planning in each area. In the last three financial years, we have responded to 100 planning consultations that varied from wind-farm applications to quarry extensions, and advised on a range of potential impacts including abandoned mines, compressible ground and hydrogeology. We also responded to two pre-preferred option papers (POP) and seven POPs to date to inform the local development plan process which will determine the next 15 years of strategic development for each council area. 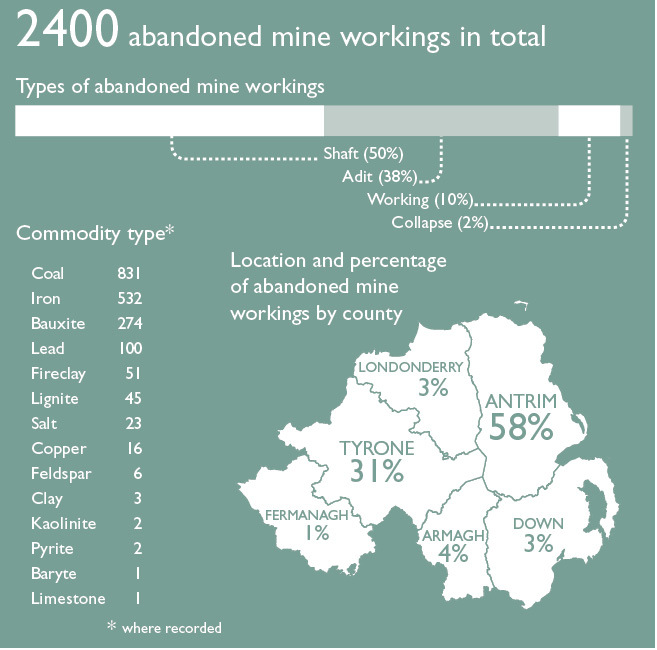 Northern Ireland has a mining industry that dates back to the 1700s. This early industry was focused on targeting base metals and coal. The legacy of that time has left mining heritage across the country. Since the mid-20th century the primary high-value material produced has been salt, with reserves that are still good for decades to come. In the latter 20th century and into the new millennium, the focus of interest has switched to gold. Between 2007 and 2012, Northern Ireland was location to the only operating gold mine on the island of Ireland at Cavanacaw. Currently the Curraghinalt deposit is ranked in the world’s top 10 gold deposits by grade. Northern Ireland is most prospective location for gold in the UK and Ireland. Roughly one quarter of it is currently under licence for exploration for high-value minerals. The potential has not been fully established and companies are continuing to invest time and resources evaluating the prospect of further gold, base metal, platinum group metal and diamond deposits. Minerals and other natural resources are essential to support a competitive, regionally balanced economy and a sustainable quality of life for everyone. It is vital there is a sufficient supply of raw and recycled materials for manufacturing, construction, power generation, transportation and agri-food sectors. In the UK, trade in minerals and mineral-based products account for 20 per cent of the economy with exports of £66 billion in 2014. Latest figures for 2016 show that the construction sector in Northern Ireland is worth £2.3 billion, 10.5 per cent of the total GVA (an increase of 18.8 per cent on 2015), a sector dependent upon aggregates and raw materials from local quarries. Sixty tons of aggregates are needed for an average home and 10k tons of aggregate, 3k tons of asphalt and 2k m3 of concrete are required for one km of a 6-metre-wide single carriageway. As mineral resources are finite and are not distributed evenly, knowledge about their whereabouts is needed to make effective and sustainable planning and policy decisions for future generations. DfE and GSNI have provided detailed written input at various stages of the LDP process and made presentations to individual councils and the NI Principal Planners’ Group. Although the significance and distribution of mineral resources have been the main focus, our geologists have also suggested that councils consider the use of sustainable, low-carbon, geothermal energy and groundwater resource potential in their LDPs. The DfE and the GSNI are currently working with councils on the adoption of ‘mineral safeguarding areas’ to ensure surface development does not sterilise critical mineral resources. As Northern Ireland is required to transition to a low carbon economy, it faces a number of energy challenges. It has abundant wind energy resources but there are seasonal, diurnal and hourly mismatches between the demand for electricity and the supply from wind farms, leading to inefficiencies in the electricity system. As a result, Northern Ireland primarily relies on oil and gas imports to manage its energy needs which have associated greenhouse gas emissions. Energy storage can play an important part in tackling both these problems, firstly by balancing supply and demand and, secondly, by storing strategic supplies of air or gas. 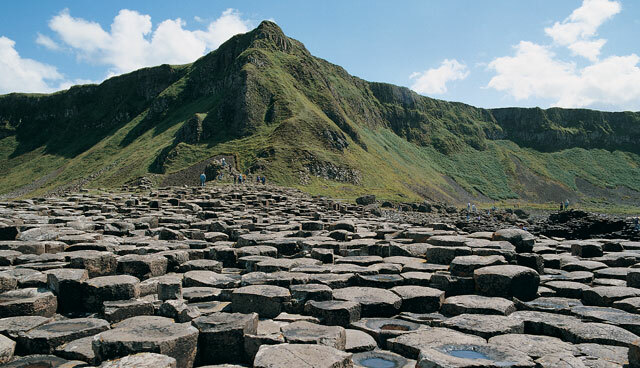 In the Larne area of County Antrim, Triassic and Permian salt beds are thick enough and occur at sufficient depth for the construction of large storage caverns by controlled leaching. Seismic surveys and deep boreholes have shown that the Permian salt beneath the northern parts of Larne Lough and Islandmagee should be suitable for creating storage caverns for natural gas or compressed air energy storage. Feasibility studies have been carried out for energy storage projects in this area and the European Commission recognises the importance of such facilities to the development of strategic, resilient, energy infrastructure on the island of Ireland. GSNI has liaised with companies from the early stages of their exploration programmes and continues to carry out seismic mapping to improve its understanding of the distribution of the salt beds. There may also be potential in geological environments beneath NI for the storage of other materials, e.g. hydrogen that may be fundamental to our future energy systems as indicated in UK’s Industrial Strategy and the UK’s Clean Growth Strategy. Northern Ireland’s abundant groundwater resources have the potential to provide the platform for a future hydrogen economy for Northern Ireland.